Subject: Implementation of Government’s decision on the recommendations of the 7th Pay Commission on CCS (Extraordinary Pension) Rules, 1939 - Enhancement of Constant Attendant Allowance. A copy of Department of Pension and Pensioners’ Welfare (DOP&PW)’s [O.M. No. 1/4/2017-P&PW(F) dated 2nd August, 2017 ##eye##] on the above cited subject is enclosed for information and compliance. These instructions shall apply mutatis mutandis on Railways also. 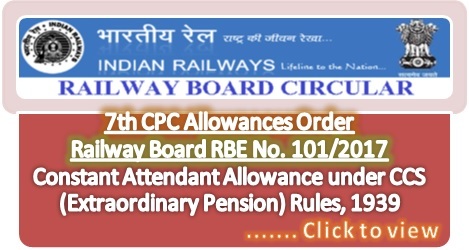 CCS (Extraordinary Pension) Rules, 1939 mentioned in DOP&PW’s O.M., corresponds to Railway Services (Extraordinary Pension) Rules, 1993.